The AMS 02-07 Subaru Rotated Mount V-band Turbo Kit is the new benchmark in Subaru performance. Designed to meet the demanding needs of road race, drag race and street cars alike, we have successfully achieved unparalleled drivability, response, and horsepower. Our unique design has been tested and refined for over 1 year to provide reliability, OEM like fitment and options never available in a Subaru turbo kit before. 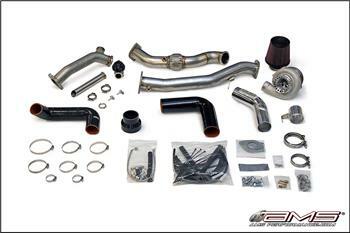 Each AMS Subaru Turbo Kit incorporates the latest V-band exhaust housing. The Precision Turbo V-band housings not only provide the most horsepower and save weight but they eliminate the need for gaskets and are easier to install. No more annoying exhaust leaks and no gaskets to replace! Implementing CAD and Casting designs we are able to produce not only an extremely strong and reliable piece but one that is not limited to the restrictions of a hand fabricated up pipe. Smooth transitions, optimal pipe diameter and solid construction make the up-pipe another key component to the AMS Subaru Rotated Mount Turbo Kit. The new AMS 900x is the same turbo that powered us to our 2009 Redline Time Attack Championship win. Utilizing the latest in billet compressor wheel technology and a newer, more efficient turbine the AMS 900x provides enormous power with the best possible spool up characteristics making the popular GT35R obsolete! The AMS 900x can make an additional 150 horsepower with only a 150-250 rpm difference in spool time over the GT35R. This versatile turbo is great for street, track or drag cars and is capable of up to 900 horsepower making it the best choice for an all around powerhouse! Each AMS Subaru Rotated Mount V-band Turbo Kit is hand built here at AMS with a meticulous attention to detail. We know what it’s like to install a turbo kit so we provide all the necessary hardware and detailed instructions for a hassle-free installation. With power output ranging from 350 – 950 horsepower our turbo kits have just about every Subaru owner covered. On just our plain old GT30R kit with a top mount intercooler, fuel and exhaust upgrades we were able to put down 485 whp and over 500 ft. lbs. of torque! This same simple combination netted an 11.3 quarter mile time in a full weight 2007 STI on stock tires!!! Just imagine what an AMS 900x can do! Kit Utilizes 4 ply silicone tested up to 50 psi of boost!